1/3 HP, 115 V, 60 Hz automatic laundry tub pump. Designed for use in residential applications to handle waste water not containing solids. The pump mounts directly underneath the laundry tub. The automatic diaphragm switch starts the motor when water enters into the pump body. The motor has built-in thermal and overload protection and the pump body is made of corrosion-resistant thermoplastic for durability. A union to connect to the laundry tub and a check valve for the discharge are included with the product. Maximum lift of 10 feet. Pumps up to 1400 US GPH. Capacity: 1400 US GPH/2’; 1200 US GPH/4’; 1020 US GPH/6’; 800 US GPH/8’; 500 US GPH/10’. 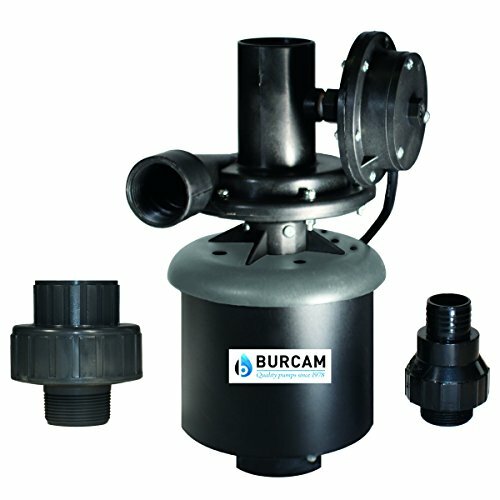 If you have any questions about this product by Bur-Cam, contact us by completing and submitting the form below. If you are looking for a specif part number, please include it with your message.